During the last week of March, Scottish Book Trust are taking the award-winning author and Waterstone’s Children’s Laureate, Lauren Child on the Scottish Friendly Children’s Book Tour. This event will be Lauren’s first tour with Scottish Book Trust and will see her visiting schools across the country from Edinburgh, Perth and Kinross, Stirling, Glasgow and Falkirk. To celebrate Lauren’s tour, we are giving away a free copy of her current book Hubert Horatio: How to Raise Your Grown-Ups. A tremendously funny and wonderfully illustrated story of the return of Hubert Horatio as he finds ways to reign in his irresponsible parents. 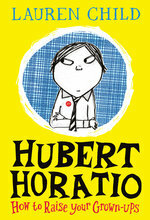 Hubert is a talented and sensible child, as well as this, he is very intelligent. Who else is known for their exceptional intelligence and inventions? Closing date is 12pm Thursday 28 March. To enter, please add your answer as a comment below along with your name, who you would like the book to be dedicated to and email address. 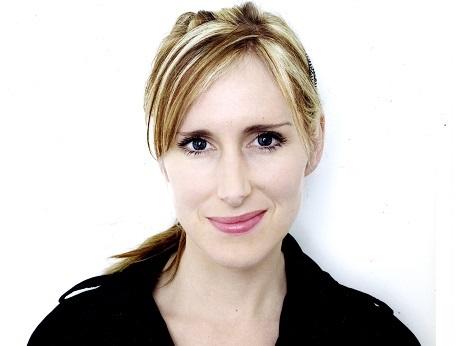 Lauren Child is a globally renowned, award-winning author and illustrator. For over 15 years, she has used her children’s books as a way to help inspire and influence children to bring out their creative side. Best known for her Charlie and Lola series, adapted into a TV series by the BBC, she has sold over 3 million books worldwide. In 2017 Lauren was awarded the Waterstones Children Laureate, which celebrates outstanding achievements in the field of children’s literature. A new addition to the Charlie and Lola series, bringing together children and parents in their shared love for the characters and their humorous past times. This time, Lola wants a dog. But what qualities make the best dog? It’s starting to look like the perfect pet for her may not be a four legged canine, but more so a rabbit! This silly, fun and thoughtful book is full of beautiful illustrations of dogs in all shapes, sizes and colours and is definitely relatable to anyone who has ever thought about what their perfect pet would be. Hubert Horatio Bartle Bobton-Trent returns to your bookshelves with a series of stories surrounding his family like. A little bit older, wiser and smarter Hubert finds his hands full with his parents, Mr and Mrs Bobton-Trent, who know how to make the most of their wealth! But it isn’t all fun and games and socialising for Hubert as it’s often the case that he is picking up the pieces and trying to prevent his grown-ups from getting into trouble! A funny and beautifully illustrated book aimed at children six years and up, this is the perfect accompaniment for night time reading or something to fill your day with laughter as you escape into the world of unconventional parents! KIERAN WALSH,25 ELM CLOSE,EPPING GREEN,ESSEX,CM16 6PT thanks. I would like the book to be dedicated to ‘Maxine’ if I am lucky enough to win. Thank you! If I’m lucky enough to win, please could you dedicate “Hubert Horatio: How To Raise Your Grownups” to all the children at Avenue Primary School. Please dedicate the book to my son Nye. If I would I would like the book dedicated to my daughters, Amatullah & Abidah. Thank you. 1. Albert Einstein. I’d like the book to be dedicated to my son, Judah. dedicated to Finn please. Who is the biggest Charlie and Lola fan! I’d love the book to be dedicated to my friend’s daughter, Lyla. She loves to read and I’m sure she’d find it a hoot! I would like the book for my daughter Tia Rose who’s just loving reading at the moment.